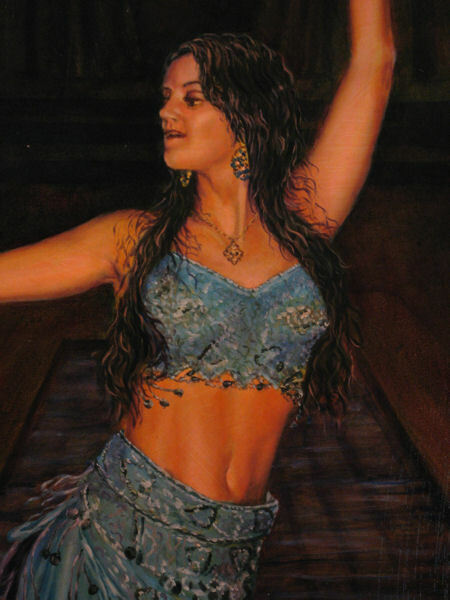 This about finishing the painting of Carina, my belly dancer. Carina is her dance name. It really didn't take all that long it was just I didn't get to work on it as steady as I had wished. For me, the key was the skin tones and the careful details of the gown. She is a terrifically beautiful woman with the type of body that works perfect for such paintings. I wanted to show the muscle tone of her belly without making her look masculine. I painted her with a rather strong tan and I feel it worked well for this gown. The gown was very elaborate. I wanted to capture both the flow of the fabric but the details of the ornament. Her hair is very long and perfect for painting a dancer. The photo I had didn't give any hint of details or even color just a black blob so I had to sort of invent the colors and even some of the details. She told me she had a lot of split ends so I went ahead and gave her some. I did enjoy the details of the strands falling over her shoulders and face. I think that helps to give it both realism and also that sense of movement I wanted. As I mentioned in earlier blogs on this painting the background was out of my head and a bit of a struggle. It may not show very well on the web but there is a nice glow to the column and the background including the pool, yes, pool, not rug, were a challenge to get to recede to the proper distance to give the illusion of depth. This was done with a series of thin transparent glazes of various blues and reds all done over several days. I had only one small photo and have never seen in person this lovely model. Therefore, I don't know if I captured her facial expression correctly or not but the face I did create is one I think is all beauty coupled with total concentration. I hope the expression is one of joy as she has told me she feels when she dances. It is the face I wanted and I can only hope it is very close to the beauty in her face, which I'm confident, is even more impressive than my painting. I've written quite a bit about this painting in the past blogs so there isn't as much to say here that isn't repetitious. The photos should tell more about it than my words. What I can say now that it is done is how it felt to paint it. I don't know rather the world will consider it good or bad, that is for the galleries, buyers and critics to say. What I can say is it felt better painting this than I have felt about a painting in a very long time. It is true I have been busy with other things and distracted during the painting process but it was never out of my mind. For various indescribable reasons every moment of the painting process felt right and was a joy. Almost all painting is a pleasure to me but this one connected to me in a very special way. I have done few paintings where this was as true as it was with this. It was a combination of the pose, the model that posed for it and the feeling I came to have for dancers and their art. I hope to do many more. I hope to do more of the same model or of her friends but as fate would have it I recently found there are a couple of belly dancers living near me. This is the best of worlds. I love to paint woman either nudes or semi-nudes and the dancers allow me to paint them as they are during the dance. I get to paint beautiful skin, hair and all the details of wonderful gowns. Above all this and on more of a commercial note not everyone is comfortable having nudes or semi-nudes in their home. 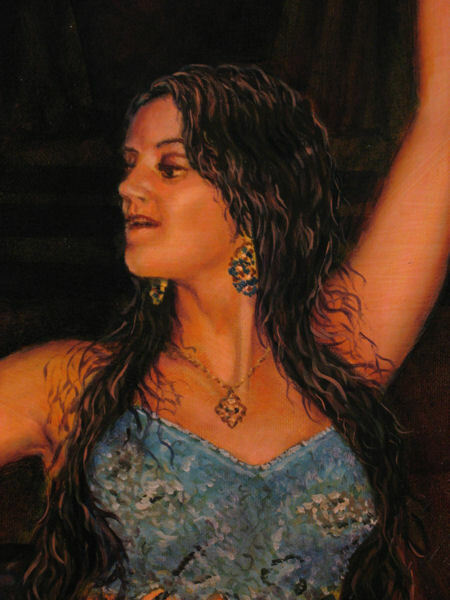 With the dancer paintings there is the same actual subject but anyone who enjoys and appreciates figure painting can justify a painting such as this.